I made these adorable and delicious triangle-shaped spring rolls yesterday from a few fresh, frozen and dried ingredients I had sitting around in my kitchen. I used that little bag of red quinoa that’s been sitting with my other bulk ingredients for months, those little nubs of fresh ginger in my refrigerator that don’t ever seem to get used and that package of spring roll pastry I bought in Chinatown months ago that got buried under other items in my freezer drawer. 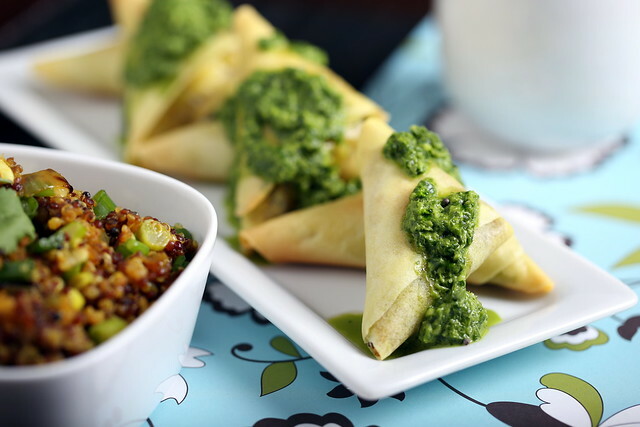 The filling here was easy to make, the samosas were fun to assemble and the cilantro-ginger sauce tasted amazing rounded out with a little coconut vinegar for a unique splash of acidity. Place the cilantro into a small food processor. Drizzle the oil over the top and process until smooth. Add in the rest of the ingredients and pulse a few times to combine. Place into the refrigerator to chill. Place the broth and ginger into a small saucepan over medium heat. While you wait for the broth to come to a small boil, place the quinoa into a fine-mesh strainer and rinse well under cold water to remove the bitter saponin coating. Then transfer the quinoa to a medium-sized skillet over medium-low heat. Toast for a few minutes. By now, your broth should be at a low boil. Scrape the quinoa into the broth, stir and cover it with a tight lid. Reduce the heat to low and allow to simmer for 15-20 minutes. Wipe the skillet with a damp towel to remove any quinoa kernels. Add in the teaspoon of oil and add in the shallots. Gently allow it to caramelize over medium-low heat while your quinoa is cooking. Once a nice and deep golden color is achieved (after about 12 minutes), transfer the shallots to a small bowl and set aside. Now return the skillet to the stovetop and melt the coconut oil over medium heat. Add in the mustard seeds, Once they start to sputter, reduce the heat to low. Add the caramelized shallots, garlic and scallions to the skillets. Stir to combine. By now, your quinoa should be ready. All of the broth should be absorbed and the quinoa should be light and fluffy. Transfer the quinoa to the skillet and stir to combine. Add in the curry and garam masala and allow to simmer over low heat for a few minutes. Remove from the heat and allow to cool. Cut 24 sheets of spring roll pastry into either 2X6 or 3X6 strips. 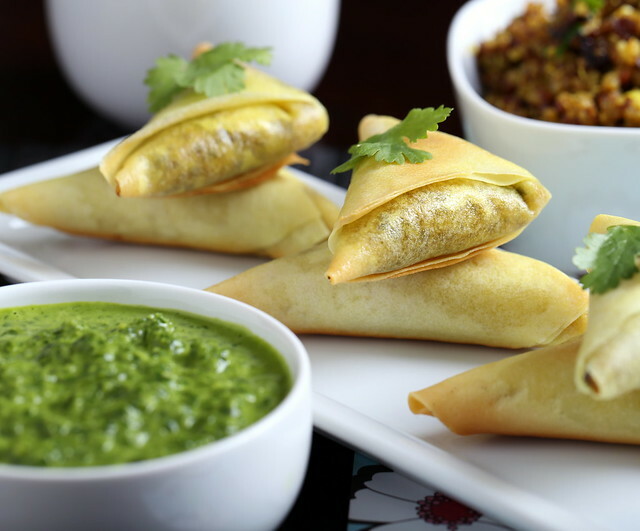 You’ll use two layers of sheets for each samosa. Spoon a heaping tablespoon of the filling onto one end of the strip. Lift the bottom-right corner and bring it over the top of the filling, then lift the straight edge over the top and repeat to create a triangle shape. Tuck in the remaining end into the folded triangle. Repeat the process until you have made 16 pieces. Preheat your oven to 425. Lightly grease a baking sheet with a little oil. Place the samosas onto the sheet and brush with a little more oil. Bake for 10 minutes on one side. Flip the pieces and bake for 4-5 minutes more, or until golden brown. Serve immediately with the cilantro-ginger sauce. Store any leftovers in the freezer. mmm wow always make the best things! all of my favorite foods and flavors, this looks delicious! you need to open a gourmet vegetarian restaurant!! These sound amazing! Perfect appetizers. And the cilantro sauce… mmm 🙂 A must make! These look and sound AMAZING!!!! oh my! these look superb! i think i may just make the filling tonight for dinner! seriously, this couldn't have come at a better time for me. i have an HS friend visiting this weekend and she's gone vegetarian for the month. it's not like we eat meat often at home but all of a sudden i'm drawing blanks on what to cook up for her. this is PERFECT to make this week to freeze and then thaw when we're ready to eat. Yay! I hope you enjoy them Lan! Coconut vinegar is not available where I live – could I substitute an equal amount of coconut water with some lemon juice? Or would rice vinegar be a better choice? Yvonne: some plain lemon juice with a touch of apple cider vinegar (if you have it) should do the trick here! gorgeous pictures and delicious food.. want! It has been more than a few weeks since trying one of your recipes…I got busy and distracted. But trying this recipe reminded me of all the reasons I bookmarked your site. Absolutely delicious! I will double the batch next time. Just one thing: Do you have any suggestions for working with spring rolls? That was my only challenge. I ruined the first few…and even after I got the hang of it better, they did not look as pretty as yours. I find them tricky to work with. Thanks Leila, glad you enjoyed! I'm not sure of any special tricks or methods I used for the folding — I just followed the steps in the embedded video above. I would just say everytime you fold, bend it a bit to ensure each fold makes a clean straight line, if that makes sense. Oh goodness! That was a huge help, thank you:) The pastille(?) looks a lot easier to work with than the spring roles. I am thinking that egg role wraps might work better? The spring roles are so gelatinous and sticky. Still, this was a good tutorial.